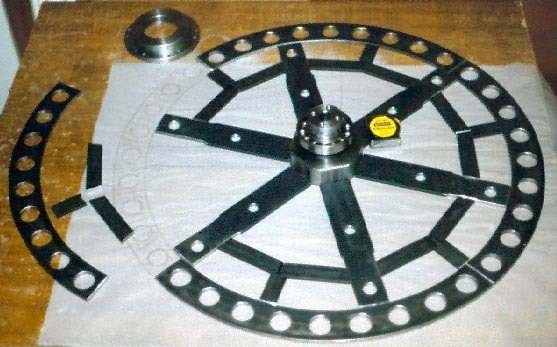 The following images show Hypno-Disc during the build. The weapon. 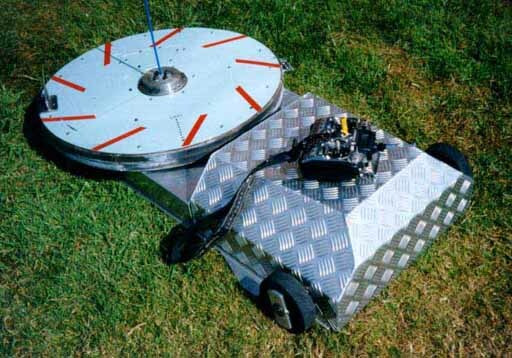 Now that's what you call a cutting disc !! 700mm dia. 18Kg turning at 500 RPM with two large high speed steel edged teeth. 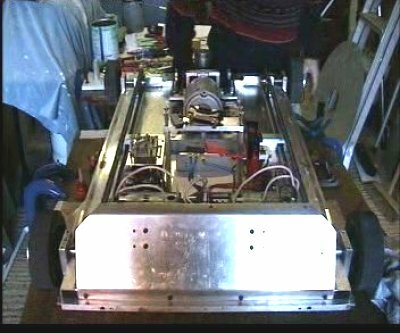 The chassis is an aluminium box section welded on top of a 4 mm aluminium plate. 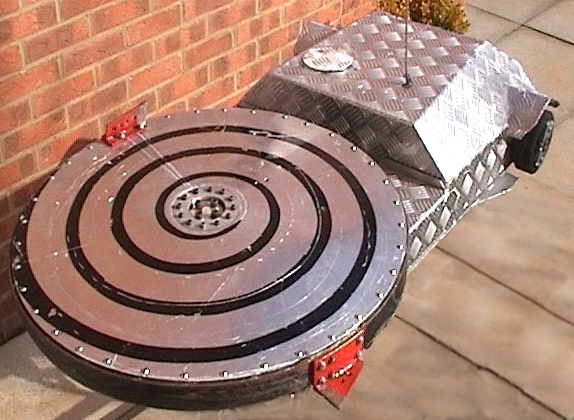 The disc is mounted on 2 single row ball bearings running in massive housings. The stub shaft is 60mm dia. That should hold it ! Dave on the right, Derek my twin brother left and my 3 1/2 year old son Matthew. Mathew say's his favourite robot is Hypno-Disc ! 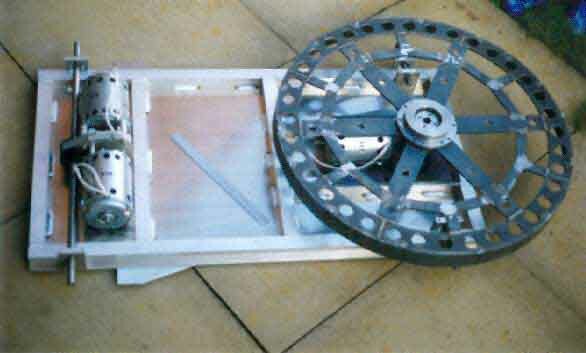 Hypno-Disc with the cover and disc removed. Hypno-Disc nearing completion. The two high-speed-steel edged teeth can be seen. One on the top left of the disc and the other on the right side of the rim. Some one once said " It hasn't got many teeth, has it ". I answered " It really only needs one, but we've put two on for good measure " ! Look at that sheet fabrication and welding. It's a shame to scratch it ! After testing we found the disc to be not rigid enough. The answer was to fix a 3mm aluminium cover in place of the blue sheeting. 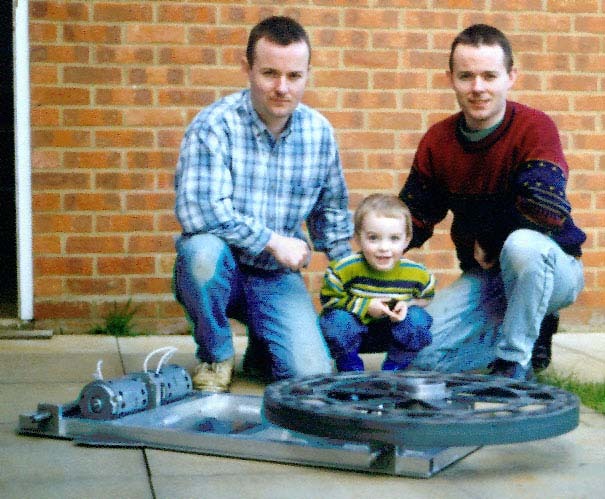 The result was that we were able to jump on the front of the disc which then lifted the rear wheels off the ground. Many thanks to Mark Puddle of Marcliff Engineering for providing the sheet metal fabrication. Superb. This shot was taken after the filming of series 3.